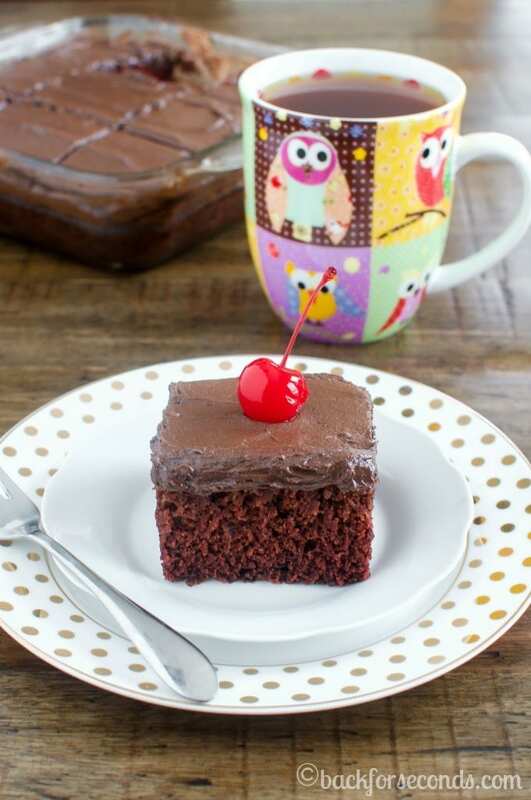 Chocolate Crazy Cake is as easy as a box mix, but tastes so much better! This recipe doesn’t use butter or eggs so it’s budget friendly too! 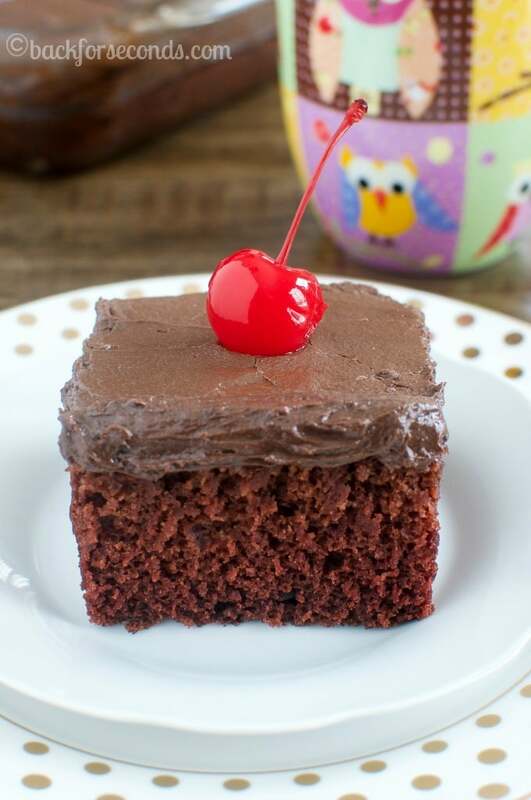 What could be better than a fluffy, moist, rich chocolate cake with creamy chocolate frosting and a cherry on top? Not much, that’s for sure! This cake is a breeze to make – as fast as a cake mix, and it tastes incredible! So, this cake has been around since the depression. It’s sometimes called depression cake or wacky cake. You mix everything in the pan you bake it in, and you don’t need any eggs or butter! It’s so delicious that you honestly don’t need frosting. You could just dust it with powdered sugar and it would be just lovely. So I made a chocolate buttercream to top off this cake, which as the name suggests, involves butter. So it butter is something you’re trying to avoid, then by all means, ditch the frosting. 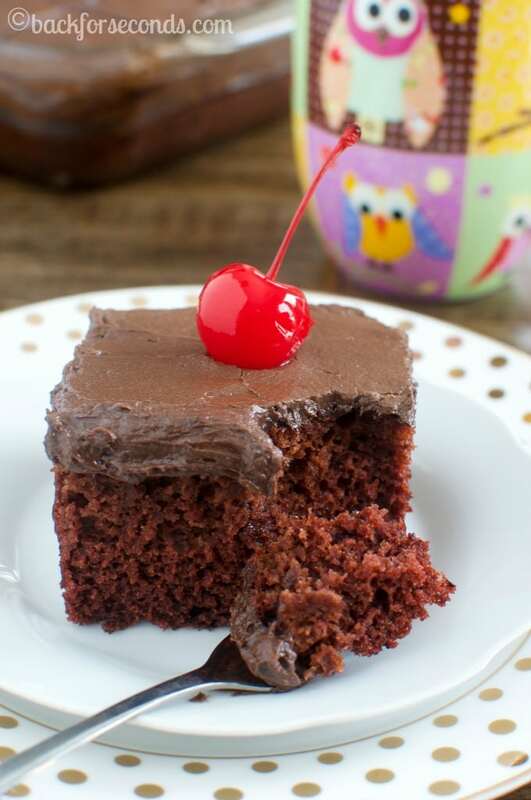 The cake is so moist and tender, and perfect with a cup of coffee or a glass of milk. Enjoy! 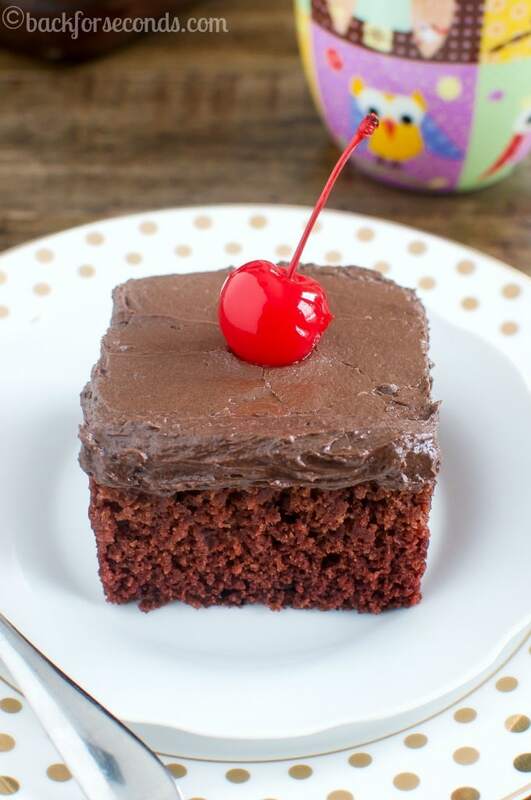 Should you choose to frost this cake, I suggest this recipe! It’s the best! Looks tasty and I enjoy budget friendly options! I love this cake…..and I’m glad you put frosting on top! It looks amazing! I love that this cake requires so few ingredients! I could eat this whole thing up! Wow! I never would of know you didn’t use butter or eggs! Looks great! I wasn’t sure if I had heard of this cake before until you said “depression cake”! I’ve totally heard of people talking about that! It looks fantastic. Loving that fact that it’s so easy to make. Reminds me of a cake my grandma use to make! Hi Marnie! I’m glad to hear you tried the cake and enjoyed it! A few reasons why your cake may have fallen in the middle are: you didn’t bake it quite long enough, or you may not have mixed in the baking powder thoroughly. I hope you give it another try and have success! Thanks for the comment! Recipe does not ask for baking Powder It says baking Soda Right ??? I’m sorry for the confusion. You will use baking soda in this recipe. Enjoy! This is such a fun idea! I’m going to have to give this a try! Wacky Cake from the fifties. It used one stick melted butter or margarine,no oil & 1/3cup cocoa powder. The butter /margarine makes a difference. I still make this cake today. Also I forgot to say use 1 tbl.spoon vinegar.i have my old paper copy laminated.recommend this cake highly.